Icelandic Relief Eye Cream delivers immediate relief to delicate under-eye skin and diminishes the symptoms of chronic stress around the eyes: puffiness, dark circles and wrinkles are minimized. This lightweight, easily absorbed formula revives the under-eye area with a blend of soothing nutrients and high powered actives while optical diffusers brighten all around. Supercharged Arctic extremophile plant firms, reduces puffiness and decreases wrinkles. Plants from the rainforest reduce dark circles and diminish under-eye bags. 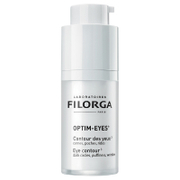 Potent anti-aging peptides help minimize the appearance of lines and wrinkles. 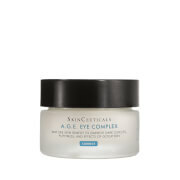 Instant cooling effect quickly soothes and refreshes puffy under-eye skin. 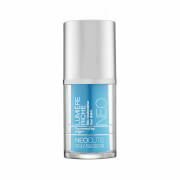 Cutting-edge formula is residue-free, contains no mineral oil, won’t clog pores or smear makeup. Pat cream gently on under-eye area with fingertips. Enjoy the slight cooling sensation. This stuff is so hard to get out of the jar... it has somewhat of a spongy consistency, hard to spread and makes my eyes burn like heck. I tried to make it work by applying it as far away from my eyes as possible but at the end of the day it's an eye cream and I should be able to use around the eyes. I ended up throwing it away. I've used top of the line department store (NM) products most of my life and this is a very nice under-eye cream for daytime use for my sensitive eye area. The texture is slightly different than I'm used to, but I like the final effect. Use a heavier eye cream at bedtime. I tried this in my quest for perfect eye creams.... For me, this isn't it. The cream is on the thin and slippery side, doesn't seam to soak in quickly. I'll finish the jar, but will not order again. It's a shame that a decent product like this one is put in such an inefficient container. The consistency of the eye cream is such that it's difficult to get the right amount on your fingertip. I find myself getting too much or too little. Plus, it's annoying to dip your finger into product because, if you have longer nails, product gets in there thus making it wasteful.Change the container and I would give it four stars. I've gone through a sample sized tub, and a full sized one. It's definitely a great moisturizer, and the "cooling" effect is there. I did not see a "brightening" effect, though. I am 50 and just starting to show my age around my eyes. This eye cream really helped to soften the lines and puffiness. It isn't greasy and doesn't interfere with my makeup. The texture of this is wild--like marshmallow fluff--but you only need a tiny bit. It smells great, dries so soft, and my dark circles have already improved. My eye area looks firmer and brighter. Great for super sensitive skin!